Chai Tea Caramels | wanna come with? I love chai tea. Especially when it’s made properly, with the spices simmered in the milk to get maximum flavour, before adding the tea. Of course the only time I get it brewed properly like this is when I get it from a proper Indian restaurant – I never make it at home like this (lazy? 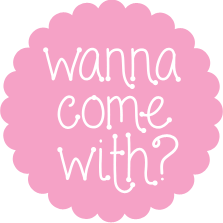 moi?). 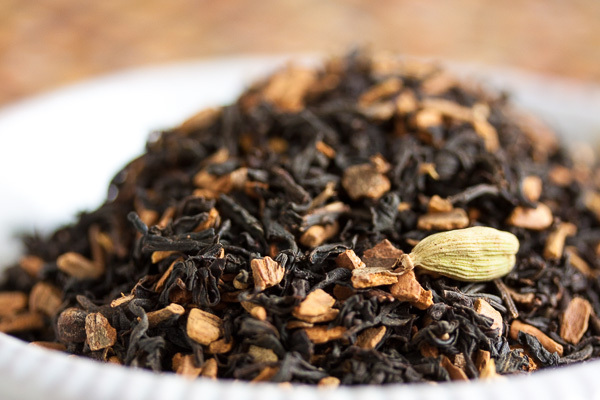 Most chai tea blends you can buy in the store have the two combined. And when you don’t have the time (or inclination) to do the long method, that’s perfectly okay! In fact, that’s exactly what we’re using in these caramels. Because conveniently, it’s what I had on-hand. I’m not sure where I got the idea to do a chai tea caramel. I’ve never had one, and I don’t recall ever seeing a recipe for one. But I’ve been into caramels lately, and just randomly thinking about different variations I can try. Once I decided to try chai, I googled. And you know I could only find three recipes online? Only three! Isn’t that crazy? We apparently need to rectify this! All of the recipes I found called for adding the chai tea blend to the milk/cream and steeping to extract the flavours, and then adding this to the caramel recipe as usual. All of them used a very similar amount of tea, so I decided to follow their lead in that. 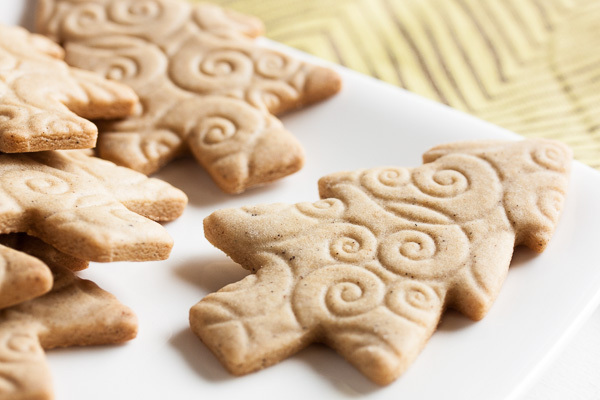 As mentioned, I found three different posts adapting existing caramel recipes to include the chai flavours. One of them just happened to be from a cookbook I own (not surprising – I have so many books the odds are pretty good). So I decided to go with that one. I also wanted to try that one because it’s very different from my usual caramel recipe. Of all the sugars and candies I’ve cooked over the years, this caramel has the dubious honour of being the first to actually bubble hot sugar on me. I’m ok! It was a tiny tiny splash, but the sudden pain was startling, and of course my knee-jerk reaction was to pull my hand out of the line of fire – never mind that I was holding a whisk at the time. Yup, sugar syrup went flying everywhere. Thanks, brain. Luckily, none of it hit me, but it was still a mess to clean up. Whee! Cooking is fun! This actually ended up being a pretty sweet caramel, but I’m not surprised as it uses a one-step cooking method (everything goes in the pot at once, rather than cooking the sugar separately). Not my preference. 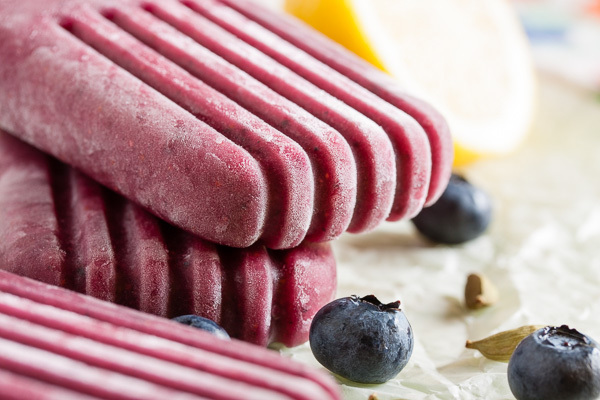 Even though the addition of fleur de sel sprinkled on top really helps to cut that sweetness down. I love the flavour of chai here, but personally, I would prefer it less-sweet. My coworkers, however, loved these as-is. And one of my coworkers made a point of coming to tell me that of all the things I’ve made, this is his favourite. And no, I’m not talking about the coworker who claims every other cookie is her favourite. I’m definitely going to try this flavour again but with my tried-and-true two-stage caramel recipe next time. 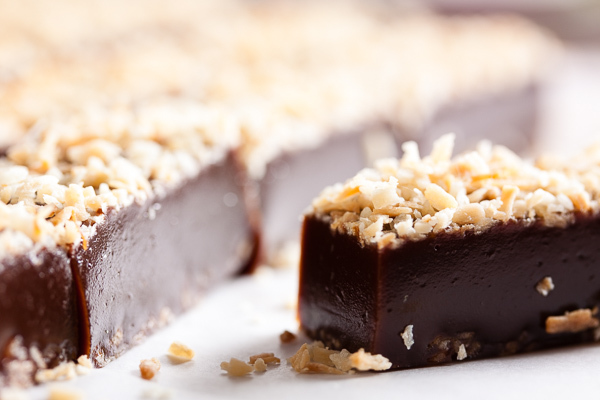 Probably soon – when I get into making caramels, I tend to make them several weeks in a row before moving on. Inspired by PopSugar, but adapted from "Fleur de Sel Caramels" from Miette: Recipes From San Francisco's Most Charming Pastry Shop by Meg Ray. Makes one 8" or 9" square pan. The number of caramels you get will depend on what size you choose to cut them. Note: when cooking sugar, subtract 2°F from the target temperature for every 1000 ft above sea level. Line an 8" square pan with parchment paper. If you don't have one, a 9" square will work, but the caramels will be a bit flatter. There's no need to oil the parchment as the caramels shouldn't stick. Set aside. Combine the cream, milk, and chai tea in a medium-sized saucepan and heat until scalding. Remove from the heat, and allow to steep for about 10 minutes. Strain this mixture through a fine mesh sieve. Discard the tea leaves. 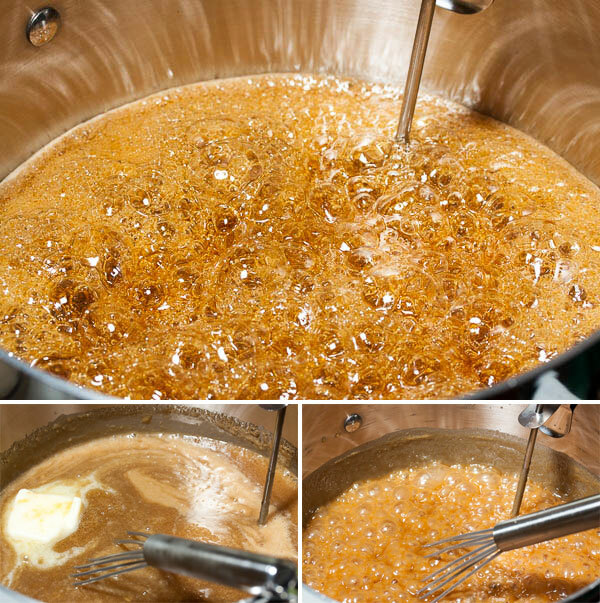 Choose a large (3 to 4 quart) heavy-weight saucepan to cook your caramel in – it needs to be large enough to accommodate the bubbling up that will happen (it will bubble up a lot), but deep is better than wide so your thermometer will be covered by enough volume to register an accurate temperature (most digital thermometers have a guideline indicating minimum depth). Combine all of the ingredients (except the coarse fleur de sel) in this large saucepan. Attach your candy thermometer and cook over medium heat, whisking constantly until it reaches 246°F. Normally I'll cook my caramels to a slightly higher temperature because the humidity is usually quite high in Vancouver, so I cooked mine to about 248°F and they turned out a perfect consistency. 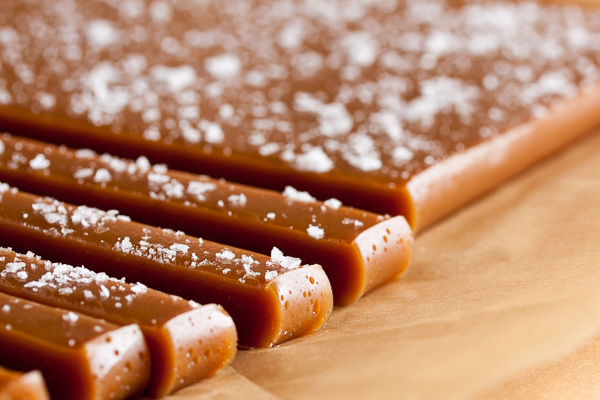 If you don't cook them high enough, your caramels will be soft and won't hold their shape. But if you go too high, they'll be hard and chewy and difficult to eat. Remove from the heat and pour the mixture into your pan – carefully, it's very hot. Don't scrape the bottom or sides of the pot in case there are some hard bits (I scraped this stuff off onto a separate piece of parchment for myself). If you choose to sprinkle fleur de sel on top, allow the caramel to cool for about 10 minutes first (if you do it too soon, it will just melt into the caramel, but if you wait too long, it won't stick). Allow to sit for at least a couple hours, preferably overnight. 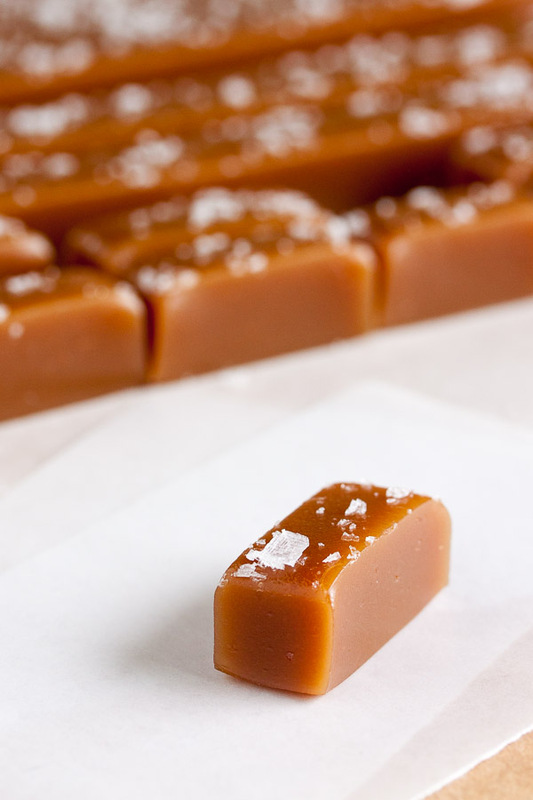 Once the caramel has set, you can cut it into squares or rectangles and wrap in pieces of parchment paper or wax paper. If you're lazy like me, you can buy them pre-cut. What an awesome idea to make chai flavoured caramels. These definitely would make perfect holiday gifts! A recipe I need to try!